The USS HERMITAGE (LSD-34), a Thomaston-class dock landing ship, was commissioned on 14 DEC 1956. USS HERMITAGE, named for President Andrew Jackson's estate near Nashville, Tennessee, was built by Ingalls Shipbuilding Corp. in Pascagoula, Miss. After fit out and shake down HERMITAGE sailed for her homeport of Norfolk, Virginia. August 1957 had HERMITAGE beginning a long series of deployments that compose the life of a "Gator Freighter". HERMITAGE was an early visitor to the Indian Ocean when she carried helicopters to Pakistan in 1959-60, for state visits by President Dwight D. Eisenhower. A South American cruise followed in 1960, then duty during the Cuban Missile Blockade in October 1962. HERMITAGE deployed once to the Western Pacific in support of the Vietnamese war effort in 1967. Returning to the Atlantic. HERMITAGE continued her deployments to the "Med", North Atlantic and Caribbean for the next 22 years. 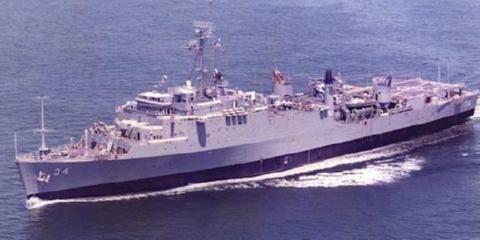 USS HERMITAGE served her country for 32 years, 9 months and 18 days, until decommissioned on 2 OCT 1989. First lent, then sold to, Brazil, HERMITAGE continues in Brazilian service as NDD Cear� (G-30). Hermitage (LSD-34) was launched 12 June 1956 by the Ingalls Shipbulldlng Corp. Pascagoula Miss. ; sponsored by Mrs. Alfred M. Pride wife of Vice Admiral Alfred M. Pride and commissioned 14 December 1956 Captain Leonard A. Parker in command. While on shakedown in the Caribbean Hermitage was informally inspected by Admiral Arleigh Burke then Chief of Naval Operations. After training operations out of Norfolk she sailed for the Mediterranean in late August to join the 6th Fleet. Hermitage participated in exercises with NATO units and visited Sicily Crete Turkey Italy Greece and Spain before returning to the States 16 November 1957. Operations primarily with fast amphibious helicopter assault equipment and tactics occupied her until November 1959. With a cargo of Presidential helicopters embarked Hermitage sailed to Karachi 2 December via the Atlantic Mediterranean Suez Canal and Red and Arabian Seas to furnish quick and safe transportation for President Dwight D. Eisenhower on his Asian and European tour. Mission successfully completed she returned home via Barcelona 17 January 1960. Foreign waters called Hermitage by the end of the year as she sailed 28 November as flagship for Admiral A. L. Reed COMSOLANT for a good will cruise to South America and Africa. In the midst of this important cruise Hermitage was diverted 19 January 1961 to carry grain to the Congo to help the United Nations combat starvation in that revolution-torn country. Relieved as flagship 3 May by Spiegel Grove Hermitage returned to Virginia 16 May and soon resumed her pattern of operations and exercises off the Virginia Capes and in the Caribbean. When the presence of Soviet nuclear missiles in Cuba threatened war in Octoher 1962 Hermitage sailed to Guantanamo to transport Marines to that threatened base and underline America's determination to maintain her position there. A second cruise to the Mediterranean from May to October 1963 took Hermitage to Naples Athens Genoa Cannes Sardinia Malta and Rota as well as other ports in the 6th Fleet's continuing role of peace-keeping and protection of American interests in that crucial area. After an assignment in February 1904 to the Caribbean Ready Squadron 12 based in Panama early in May Hermitage undertook a logistics lift to Bermuda and Sydney and Halifax Nova Scotia and in the fall took part until late November in the Navy-Marine Corps peacetime exercise "Steel Pike I " visiting ports of Malaga and Gibraltar. In June 1965 she participated in a 3-month deployment to the Caribbean area during the later stages of the Dominican Republic crisis making practice amphibious landings at Vieques Island. After completion of overhaul in February 1966 followed by refresher training and amphibious training Hermitage transported a marine battalion to the Caribbean in May. Through 1967 she continued in her assignment to the Atlantic Fleet.